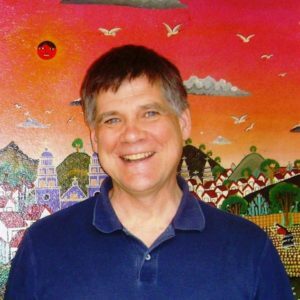 Gary Cozette is the co-founder and the immediate past program director of the Chicago Religious Leadership Network on Latin America (CRLN), a 600-member network of both lay and clergy leaders who together work for human rights, justice and peace in Latin America. Prior to this, Gary served as a Presbyterian Church (USA) lay mission worker in El Salvador from 1984-1987 doing human rights reporting from the Roman Catholic Archdiocese of San Salvador to an ecumenical urgent action network in North America. Gary has led over 35 delegations of religious and community leaders to Latin America, including delegations to El Salvador with three current members of Congress from Illinois (1989), Cuba with the Illinois Conference of Churches (2000), and Colombia with Chicago area African-American leaders (2003). Previously, Gary has served on the Board of Governors of the Human Rights Campaign (HRC) as well as the board of CRISPAZ in El Salvador. He lives in Chicago with his spouse Joseph Lada.